One of my earliest adventures in comics was the Madrid Comic Book Convention in November of 2002. This trip cemented many comics industry friendships, and I cherish them to this day. My friend Mike Kennedy just posted a Facebook video about Botin, the World’s Oldest Restaurant, which was the first restaurant we tried in Madrid, triggering this trip down memory lane. The first thing that struck me about Botin was the prosciutto, sitting out in the open, and the liberal number of flies alighting on the marbled hunk of meat. I ordered prosciutto-free entrees. 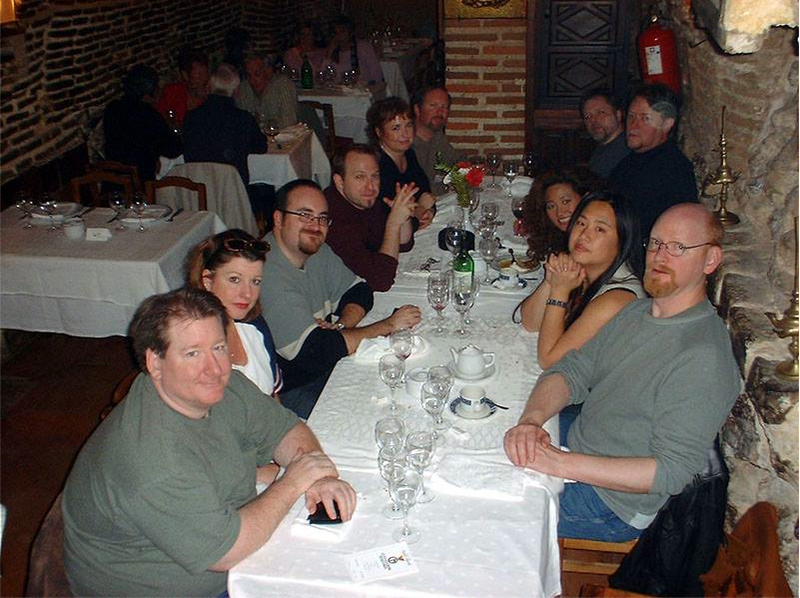 Comics legends, bestselling authors and me at Botin, The World’s Oldest Restaurant, in Madrid. L-R: Dave Dorman, me, Ramon Bachs, Mike Kennedy, Rebecca Moesta, Kevin J. Anderson, Chris Warner, Randy Stradley, Randy’s wife at the time, Joyce Chin, and Art Adams. For the paranormal fans among me, note the orb over Randy Stradley’s face. Along with Dark Horse Comic‘s Chris Warner and Randy Stradley, writer Mike Kennedy (now publisher of Magnetic Press), artist Ramon Bachs, and NY Times bestselling authors Kevin J. Anderson and Rebecca Moesta, we embarked on a five-day odyssey of comics autograph sessions where the crowds rushed the tables and orderly lines were not even a possibility, tapas meals together at 10:30 p.m. were the norm (yes, it IS actually possible to tire of garlic potato salad after three nights in a row), we experienced the world’s best hot chocolate (like hot chocolate pudding poured into a mug), squid ink pasta (I’m not a fan, Kevin J. Anderson ended up eating mine) and Rebecca Moesta introduced me to mango yogurt shakes at the one vegetarian restaurant we hit (I am still hooked). In the hotel lobby one night before going out for tapas, one of our handler Miguel’s friends brought in a platter of thinly sliced horse meat appetizers, which was a delicacy there, but I just couldn’t do the whole when-in-Rome thing. I love my horses too much. Joyce and I hit the Museo del Prado and followed it up with a lunch at the Hard Rock in Madrid (do yourself a favor and do NOT order the spaghetti there–it was out of a can). Since I’m a morning person, the whole noon siesta and up-all-night culture was an adjustment. I could handle it better today than I did back then. The one thing that stays with me was how beautifully the buildings were lit at night. I’m hard-pressed to describe it, but it’s something you have to see at least once in your life. This was the pre-iPhone era, so few pictures remain of that trip; this one from Mike Kennedy’s archives is such a treasure to all of us. Immediately following the Botin lunch, I was the naive tourist flinging my purse about like I hadn’t a care in the world–it was promptly pick-pocketed in the town square. Miguel took me to the local police station, but after sitting with the unwashed masses for 30 minutes and feeling more endangered than safe, I begged off. It was fruitless. My wallet was long gone. I spent the next hour on the phone canceling all credit cards. Lesson learned. On Facebook right now, we’re all posting, reminiscing, and wishing we were back at Botin, reliving that moment. H.G. Wells, how’s that time machine coming along, anyhow?